This TOEFL word list consists of 1600 middle level words, especially focusing on reading test. TOEFL reading is the main section to evaluate vocabulary skill. If you are planning to apply for top universities, or for any reasons you need an excellent score in report, you shouldn’t ignore reading test. This TOEFL word list is collected to help you get a better score from reading test. Words in the list is mainly for academic reading test. Tutors of ww.examword.com have revised their explanations according to TOEFL test conventions. Considered that TOEFL test takers are ESL (English as Second Language) or EFL (English as Foreign Language), each word includes definitions in 20 languages to assist them to understand its meaning more exactly. In general, the middle size and middle level TOEFL word list is a job of 2 weeks to learn and review. If you are with strong enough vocabulary skill, you may finish it in one week . This estimation assumes that you already know more than half to 60 percent words in the list. In this circumstance, the word list's main function is to review known words quickly, and meanwhile study some new words. If you have too many unknown words, or say you cannot complete it in two weeks, you had better give up this TOEFL word list, because it means you possibly missed some basic and high frequency TOEFL words. An easier or more fundamental word list may be more proper to you situation. In the view of either TOEFL test or normal English study, higher frequency words have absolute priority to learn. Of course, if you decide to stick to the word list, your pace is flexible, although we suggest less than 2 weeks. The word list also has built-in tools for each word, like spelling and match practice, offline cards. They are helpful to study and practice new words. In addition, you can leverage powerful app VSO(Vocabulary Study Online) to study the word list. Load TOEFL Word List 1600 to the smart online app, your vocabulary building will be managed and scheduled scientifically. It will improve your efficiency of TOEFL vocabulary preparation dramatically. This TOEFL word list is relatively short because it skips some high frequency words. If you aren't confident for own vocabulary level, you need to select a larger vocabulary to work. 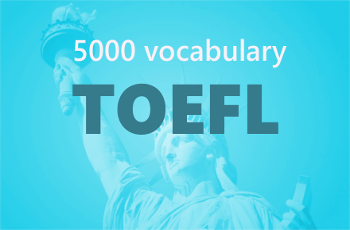 5000 TOEFL Vocabulary List, the largest TOEFL vocabulary in the website, reflects the requirement of the middle TOEFL vocabulary skill. It's a good option to have a try. Amazon Kindle or other ebook distributors. obscure; profound; difficult to understand. made by humans; produced rather than natural.